The fracking consultation has ended. What happens next? — Let's stop fracking! Scotland has rejected fracking in huge numbers. There were over 40,000 responses to the consultation stating that this industry must not be allowed to go ahead. 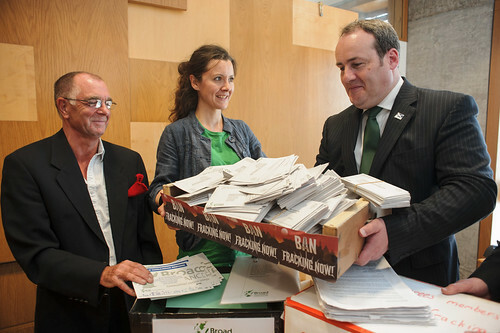 Friends of the Earth Scotland alone had 16,000 people taking action online and another 4,500 who signed postcards. We also saw a broad range of environmental groups – representing over 150,000 members and supporters calling on Scottish Government to prohibit this industry - as well as Friends of the Earth groups and anti-fracking groups from around the world. The Scottish Government will conduct an analysis of responses over the next few months and has committed to making a recommendation to Parliament before the end of the year. MSPs will be invited to debate and vote on the issue, before Ministers make their minds up on the future of the industry. Energy Minister Paul Wheelhouse has previously stated that "of course [the Scottish Government] will respect the will of Parliament on this issue." In June 2016, the Scottish Parliament actually voted to ban fracking. However, this motion was non-binding despite receiving the backing of Labour, the Greens and Liberal Democrats. The Scottish Tories voted against it and the SNP abstained. In addition to the Scottish Government plans, the Labour MSP Claudia Beamish is progressing her own bill to ban fracking. This Private Member’s Bill has garnered the necessary public support, along with backing from Greens & Lib Dems. In our ‘belt and braces’ approach to stopping fracking we'll also be supporting this plan to ensure that one way or another, fracking is stopped for good in Scotland . We know the fight against fracking is not just in Scotland and we’ll be working over the summer to support struggles in England. Drilling rigs are expected on site in Lancashire any day now. Short sighted political backing for the industry is met with huge public opposition wherever drilling is proposed. The next few months could see several other communities on the frontline as they protect their environment and health from this industry. Saturday 10th June 2-4pm, Edinburgh Methodist Church, Nicolson Sq. Join Wenonah Hauter, Executive Director of campaign group Food and Water Watch as she presents her new book on the fight against fracking in the US. Frackopoly shines a fresh light on the influence the oil and gas industry has in politics and chronicles the political power generated by an exciting grassroots movement that is fighting to ban fracking, keep fossil fuels in the ground and help take back our democracy. This is a free event. Please sign up on Eventbrite. Join us in the beautiful settings of Wiston Lodge, Biggar, for three days of workshops, ideas and action guaranteed to get you inspired, motivated and connected. We'll be sharing learnings from the fracking campaign in Scotland, learning about what’s going down in England and how we can stand in solidarity with affected communities worldwide, and getting skilled up with some non-violent direct action training. Whether you’re new to environmental justice or a seasoned campaigner, don’t miss out! This event is family-friendly and open to everyone so please spread the word.